This conference is comprised of the deans of schools of business at all 28 Jesuit colleges and universities in the U.S. They meet at one of the AJCU institutions every year to discuss new initiatives and collaboration among Jesuit business schools. Click here to download the Conference By-Laws. 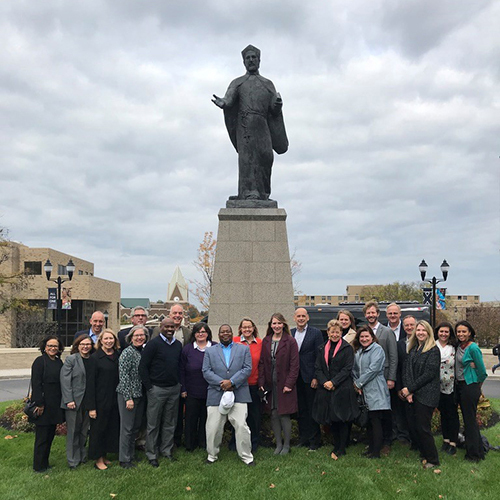 During the 2015 AJCU Business Deans meeting at Xavier University, members discussed the rapidly growing problem of predatory publishing and its detrimental effect on academic research. In response to the problem, the Deans unanimously endorsed a resolution, opposing predatory publishing. Taking this collective stance against the dilution of quality in academic scholarship is important. It puts predatory publishers on notice that the Deans do not support their business model, and it serves as a reminder to the rest of the profession that Jesuit institutions remain at the forefront of excellence and ethics in education and research. Click here to download the resolution as a PDF.